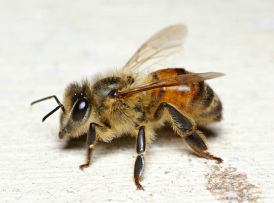 There are three different types of honey bees: the queen, drone and worker bees. It has been confirmed that only the queen and workers are females while the drones are males. Each different type of bee can be distinguished based on their physiological appearances. The picture on the left clearly depicts the differences between each type of honey bee. The queen is noticeably the largest and has an elongated pointed abdomen. The drone bee is relatively smaller than the queen and is characterized by its larger eyes and dumpy abdomen. 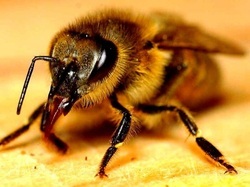 The drone bee is the only bee that does not contain a stinger. The worker bee is the smallest of the three and is characterized by its more rounded abdomen and has pollen sacs on their legs allowing for pollen collection. You will find only one queen bee per hive and she lives the longest, with a life span up to 3 to 5 years. The only time the queen will be spotted outside of the hive is to mate with several drone bees which allows her to remain fertile for the rest of her life. Majority of her time is spent inside of the hive where she lays eggs to replace the bees that die. The queen bee can lay up to 2,000 eggs per day. Being the queen can be taxing, and her workers attend to her needs by bringing her food and clean up after her. The drones also spend most of their time inside the hive with the exception of the mating flight with the queen. There are approximately a few hundred drones in each hive and when autumn comes around, the worker bees kick them out of the hive after their purpose is served, and they are left to die. The worker bees keep the hive up and running. There are roughly 20,000 to 50,000 worker bees and each one is infertile. They will occasionally lay eggs however, they are unfertilized and result into drone bees. Only the queen bee can produce worker bees and a future queen bee. As the worker bee ages, their job in the hive changes. After hatching, they will be fed by other workers and soon after replace those workers taking care of the younger bees. When they are 10 to 12 days old, they begin to produce wax from glands which can be found on the abdomen and begin to construct and repair honeycomb. After a while, the worker bee will begin to collect nectar, as well as pollen and water for the hive. Bees need water in order to dilute the nectar that is fed to the larvae and to keep the hive cool during the hot summers. It is important to take not that a worker bee born in the summer has a shorter life span than that of a bee born in the autumn or winter. A summer bee has a life span of 5 to 6 weeks, while the autumn and winter bee has 5 to 6 months to live. This is due to the work load in the different seasons. Summer born worker bees have to work harder to maintain the hive's temperature while in the colder months it does not require as much. The life cycle of a honey bee consists of four stages: egg, larvae, pupa and adult. After the queen mates with drone bees, she lays her eggs in a wax cell. After 3 days, the eggs will hatch and turn into worker larvae. At this time, older worker bees will feed this newborn as much as 1,300 times a day. After 6 days, the egg cells are capped and the larvae spins itself a cocoon and becomes a pupa (Honey Bee Life Cycle). It takes about 10 days for a worker bee to break from the pupae - an adult worker bee.